Jewish Federation of South Palm Beach County: Mazal Tov, Ladies! 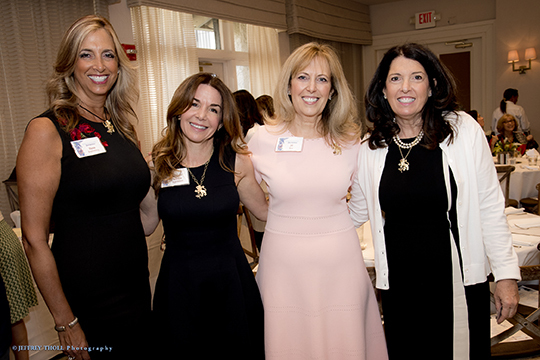 The 2018-19 Women’s Philanthropy Board Installation honored an esteemed group of women leaders constantly empowering each other and making our Jewish world a better place. Congratulations go out to April Eisen Leavy for her inspired tenure as Chair of Women’s Philanthropy and for passing the gavel to incoming Chair, Jill Goldfarb Rose. Other honorees included Alicia Spero as the winner of the Dorothy Seaman Leadership Award, which recognizes a member of the Federation’s Women’s Philanthropy Board who embodies the values of tikkun olam, tzedakah and leadership. Susan Bodner Levine was recognized for her outstanding tenure as WP Director as she assumes new role as Director, Campaign Projects. We also recognized the past officers and thanked them for their service, and then we welcomed in the new leadership. Thank you to everyone who spent the morning celebrating the people and achievements that makes Women’s Philanthropy such a dynamic asset to our community.